To illustrate the new attributes and some of the new input types, we’ll be building up a simple sign up form. Every sign up form is essentially the same, you fill in your details and click submit. How many times has the form been reset on you after you’ve missed a required value or not provided a strong enough password? To help prevent this, the first attribute we’ll be using is the required attribute. Adding this to a input box will prevent the form from submitting until a value has been provided. The next attribute we’ll be adding is the autofocus attribute. This attribute automatically assigns focus to the form on page load. This is a simple enhancement, but one that makes life so much easier. HTML5 also introduced a few new input types, the first one we’ll be using is the email type. This performs basic validation on the value to ensure it meets standard email format rules. The final attribute we’ll be looking at is the pattern attribute. The pattern attribute allows you to specify a regular expression that will be used to validate the input value. This gives you the option of doing some pretty powerful client-side validation. In this example, we’re going to make sure the password field has at least 1 lowercase, 1 uppercase value and is at least 6 characters long. Using these selectors you can provide clear, visual guides to what exactly is incorrectly filled out in a form. 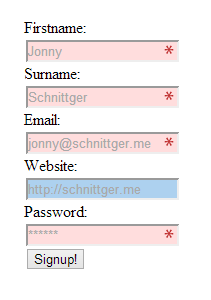 Here I am styling invalid inputs with a red background and valid ones with a green background. I’m also providing a more complex selector to display and asterisk image in required inputs while maintaining the colored background. Finally I’m styling optional fields in a blue. While it’s great that client-side validation has been vastly improved in HTML5, don’t forget that you still need to use server-side validation!